"What Does a "Good" Adjustment Look Like?" Michael Pettis, China's Financial Markets (1 September 2014). Read the whole thing. While Pettis does not explicitly make this case, essays such as this have convinced me that the decisions made in Beijing are first and foremost an attempt to shape China's political economy. Those paying attention to developments in Chinese foreign policy or domestic affairs will not have trouble connecting the economic realities Pettis discusses with Beijing's behavior in both arenas. This is an outstanding group-discussion style podcast on Japanese history. I have been so impressed that I have added the Samurai Archives to the Stage's blog roll. This episode on Oda Nobunaga was the one that got me hooked. "Being a Young Adult in this Generation Sort of Feel Like Stumbling Upon the Desolate Remains"
This may be the most depressing thing you will read this week. Everything I have written about how the rising generation has no future and the threat this poses to America's stability and prosperity is in here. "The Creepy State Attracts Creeps"
Mark Safranski, Zenpundit (4 September 2014). This deserves to be national, "Call your Congressmen!" news. It isn't. "How the GOP Got this Way"
Michael Barone, Washington Times (8 September 2014). A convincing comparison of the relationship between the Tea Party and the GOP today with the Peace Movement and the Democratic Party in the 1960s-70s. "Places With Guns Don't Have Higher Crime Rates,"
"What the NeoReaction Doesn't Understand About Democracy"
Eli Dourado, The Umlaut (20 August 2014). "Transformation or Bust, Part II"
"Zombies once Destroyed Japan's Economy--Now They Are Infecting China's"
Gwynn Guilford, Quartz (29 August 2014). See my comments above about how China's political economy drives Zhongnanhai's decision making process for why the data included in these two essays is important. "Hong Kong's Share of China's GDP"
Tweet by @ianbremmer (2 September 2014). This one chart will tell you more about Beijing's recent moves in Hong Kong than an essay of two thousand words could. "Review: Hard Road Home: Selected Essays by Ye Fu"
I reviewed this book with great praise back in March. It is nice to see another thoughtful review. "ISIS Tentacles Reach Towards China"
I am incredibly impressed with this essay; most China hands now the Beijing scene well, and the best of them keep track of top players in Tokyo, Hanoi, Seoul, Manila, and other parts of maritime East Asia. Very few do all of that and know enough about Pakistani internal politics and Jihadist networks to write an essay like this. "The US and China: sliding from engagement to coercive diplomacy"
David Lampton, PacNet, no. 53 (4 Aug 2014). 1) Why (or to what extent) has Beijing changed a successful policy that for more than three decades facilitated a dramatic increase in Chinese comprehensive national power without engendering a proportionate rise in the anxieties of others? 2) To what extent is China responding to the behavior of others and to what extent is it seizing on small provocations to make advances? 3) Why is Beijing jeopardizing the primacy of its internal, economic reform goals by alienating substantial chunks of its periphery and running the risk of an ever-stronger international coalition pushing back? 4) Why is Beijing allowing itself to be driven into a corner of alignment with Russia, an economic underperformer that violates the PRC’s own 60 year-old-principle of respecting national sovereignty? 5) What are the lessons that we learned from the Cold War about strategy, deterrence, and coercive diplomacy that have applicability in current circumstances in a far different globalized world? 6) Has US policy in any way given added push to negative developments? Long before written symbols, even before spoken language, our ancestors communicated by gesture. Even now, a lot of what we communicate to each other is non-verbal, partly hidden beneath the surface of awareness. We smile, laugh, cry, cringe, stand tall, shrug. These behaviours are natural, but they are also symbolic. Some of them, indeed, are pretty bizarre when you think about them. Why do we expose our teeth to express friendliness? Why do we leak lubricant from our eyes to communicate a need for help? Why do we laugh? "Genes Influence Young Children’s Human Figure Drawings and Their Association With Intelligence a Decade Later"
Rosalind Arden1, Maciej Trzaskowski1, Victoria Garfield2 and Robert Plomin1, Psychological Science, (Publ. online before print, 20 August 2014). "Der Todd des Der Euro" and "The 'Anthropology' of the Financial Crises"
"Pseudeoerasmus," Pseudoerasmus (1 August 2014). Psuedo's dissection of the Eurozone is both novel and deeply informed . The posts' argument ranges from demographics, to anthropology, economics, and sociology--all in all strongly recommended! "Anthropometry, Physical Anthropology, and the Reconstruction of Ancient Health, Nutrition, and Living Standards"
Geoffrey Kron, Historia: Zeitschrift für Alte Geschichte, vol 58, iss 1 (2005), pp. 68-83. This survey of skeleton heights from classical Greece and Rome is useful. It turns out that Roman and classical Greek men were taller than Italians or Greeks born before and during the Industrial Revolution! In contrast, the mean height for U.S. Army recruits barely budged between 1776 and 1943. See also: "Ancient Skulls Show Civilization Rose as Testosterone Fell," Matt Picht, KTVU (2 September 2014). "Plant Breeding, Not Working Slaves Harder, Drove Cotton Efficiency gains in the South" and "Baptism by Blood Cotton"
"Where We Came From and Where We Went, State by State"
Adam Elkus, Rethinking Security, (31 July 2014). If you missed this piece when it was originally published two months ago you should go and read it now. I'll be passing this post along for another four or five months to everyone I can. Adam Elkus has a new blog by the way. See his "Rationality is Overrated" and "The Ballad of BoxeR" to get a sense for the topics he writes about there. "The Future of Warfare: Small, Many, and Smart vs. Few and Exquisite"
TX Hammes, War on the Rocks (16 July 2014). Michael Green and Nicolas Szechenyi, CSIS Asia Program (Landham, MD: Rowand and Littlefield, July 2014). "Kim Jung-Un: Starving for Power"
Patrick Cronin, War on the Rocks (25 August 2014). "Does pre-industrial warming double the anthropogenic total?" William Ruddiman,Steve Vavrus,John Kutzbach,Feng He, The Anthropocene Review, vol. 1 no.2 (August 2014), 147-153. Braeme Wood, The Atlantic (13 August 2014). See also: Burt Likko, "Abolish Advanced Placement" Ordinary Times (14 August 2014). See also parts two and three of Adam Tooze's outstanding set of lectures. 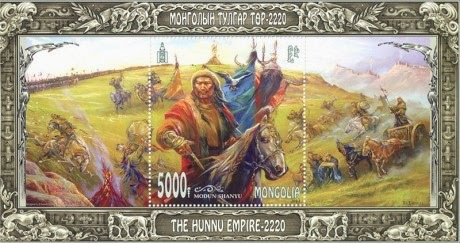 A Mongolian stamp depicting Maodun, founder of the Xiongnu Empire. What is peculiar to China’s political culture, and of very great contemporary relevance is the centrality within it of a very specific doctrine on how to bring powerful foreigners—indeed foreigners initially more powerful than the empire—into a tributary relationship. Specialists concur that this doctrine emerged from the very protracted (3rd century BCE to 1st century CE) but ultimately successful struggle with the Xiongnú (匈奴) horse-nomad state, just possibly remote ancestors of Attila’s Huns, but definitely the inventors of the Steppe State political system that would be replicated by all their successors, and more adapted than replaced even by the Mongols. I am a fan of the analytic approach Mr. Luttwak uses here. History is important. Ancient history is important. It might seem silly or frivolous to examine ancient polities in order to understand modern politics, but the insights this lens of analysis makes possible are hard to get through other means. Many of these insights come from seeing the world through the long view. The political and social structures civilizations are built on emerge on a timescale far longer than the lifespan of any individual human being. Many of the constraints societies face—be they physical or cultural—can only be seen clearly by examining centuries of conflict, competition, and collapse. Just as important as these recurring patterns of history are the perceptions today's decision makers have of the past. China's 3,000 recorded years of war and high politics offer many different lessons to the Chinese statesmen of the modern era. The lessons they choose to draw from this history shape the decisions they will make tomorrow. Thus if Edward Luttwak wants to talk about how the echoes of the Han-Xiongnu war can be heard in modern China's foreign policy, I am all ears. Long term readers of The Stage know that there are few conversation starters I would find more thrilling to hear. Too many contemporary controversies cannot be understood until we step back and look at world affairs from the long view of history. But there is a catch in all this: the history has to be correct. It must accord to the facts. If one uses the past to interpret the present then your reading must be based on events that actually happened. This cannot be said for Mr. Luttwak's essay. The story he tells simply did not happen. It is this successful transformation of a once superior power first into an equal (signified by imperial marriages) and then into a subservient client-state that seems to have left an indelible residue in China’s tradition of statecraft. It was achieved with a specific “barbarian-handling” tool box first described by its early practitioner, the scholar and imperial advisor Lou Jing (婁敬) 199 BCE. 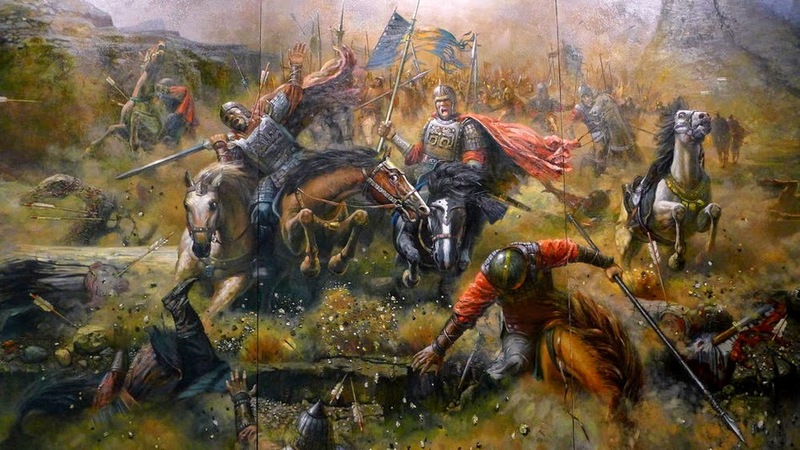 His method was first applied when the Xiongnú were still very strong and the Han were not only tactically inferior (their chariots were totally obsolete for fighting mounted archers) but also beset by political divisions, so much so that a 198 BCE4 treaty required the payment of an annual tribute in kind (silk, grain, etc. ), and the formal attestation of equality for the Chanyu embodied in a marriage alliance, formalized by imperial letters that make the equality fully explicit. The first barbarian-handling tool is normally translated as “corruption” in English translations, but perhaps “addiction,” or more fully “induced economic dependence” are more accurate: the originally self-sufficient Xiongnú were to be made economically dependent on Han-produced goods, starting with silk and woolen cloths instead of their own rude furs and felt. At first supplied free as unrequited tribute, these goods could still be supplied later on when the Han were stronger, but only in exchange for services rendered. The second tool of barbarian handling, is normally translated as “indoctrination”: the Xiongnú were to be persuaded to accept the authoritarian Confucian value system and the collectivistic behavioral norms of the Han, as opposed to the steppe value system, based on voluntary allegiance to a heroic (and successful in looting) fighting and migration leader. One immediate benefit was that once the Chanyu’s son and heir married an imperial daughter, he would be ethically subordinated to the emperor as his father-in-law—remaining so when he became Chanyu in turn. What Luttwak is describing is the heqin, or the “peace marriage” system. The system was put in place during the reign of Han Gaozu, first emperor of the Han dynasty, shortly after his disastrous defeat at Pingcheng (200 BC) The empire was at that time still quite new and the Han did not have the resources to wage large-scale war against the Xiongnu. Gaozu was left with the difficult task of finding a permanent resolution to threat the Xiongnu posed to his realm. The heqin system was the best his court could come up with. The Han Emperor would provide an imperial princess to be a wife of every Chanyu (Note: In reality the 'princess' was always a concubine taken from the imperial palace. A multitude of legends and love stories about these concubines have made this a strong and enduring memory in Chinese popular culture for the last two millennia). The Chanyu—or one of his subordinates—would take regular trips to Chang’an (the Han capital) to pay his respect to the emperor. During these visits the emperor would bestow lavish gifts upon the Xiongnu retinue as a sign of their friendship. "The right to trade at the frontier had to be wrung from an unwilling Han court because China opposed it for political reasons. Although the Xiongnu were a natural market for the grain surpluses and craft production of the northern areas, such trade would orientate the population away from the Han court and Chinese interests. The Han court attempted to tie the frontier regions to the center even if it meant hardship for the local population. Its policy was to create as much cleavage between the steppe and China as possible; the Great Wall was to be a barrier against all contact with the steppe. The Shanyu was forced to overcome this reluctance by extorting trade rights the same way he extorted subsidies--by raiding, or threatening to raid, China." Luttwak's descriptions of the heqin policy's aim is basically correct. It was designed to corrupt the Xiongnu and slowly 'Sinicize' them. It was designed, through the power of Confucian family norms, to subordinate the Xiongnu ruler to Han Emperor. What Luttwak neglects to mention is that the policy was a complete and utter failure. “In the fourteenth year of Emperor Wen’s reign the Shanyu led a force of 140,000 horsemen though the Chaona and Xiao passes, killing Sun Ang, the chief commandment of Beidi province, and carrying off large numbers of peoples and animals. Eventually he rode as far as Penyang, sent a surprise force to break into and burn the Huizhong Palace, and dispatched scouts as far as the Palace of Sweets Springs in Yong [bringing them within eyesight of the capital]. …The Shanyu remained within the borders of the empire for a little over a month and then withdrew. The Han forces pursued him beyond the frontier but returned without having been able to kill any of the enemy. This was one of only of a dozen major incursions between 200 BC, when the first treaty was signed, and 133 BC, when Han Wudi decided to launch the empire into open war with the Xiongnu. It also points to the heqin treaties’ greatest failure: they did not provide a meaningful sense of security for the Han. Under the heqin system the initiative belonged to the Xiongnu. The peace was theirs to keep—or break. The Han lacked an effective deterrent to ward off Xiongnu attacks and possessed little power to retaliate once attacks came. Not all of these raids were organized or even condoned by the Chanyu. One of the inherit weaknesses of the ‘co-equal’ treaties between the Shanyu and Emperor was that the two sovereigns did not exercise equal amounts of control over their respective empires. The Xiongnu confederation was an amalgamation of different tribal groups forged together by the Xiongnu ruling line. The Chanyu's power was proportionate to the threats his people faced or the rewards he could promise them. If he tried to control the tribal autocracy with too tight a hand the inevitable consequence would be flight (to China or to other steppe confederations on the steppe) or open rebellion . If one of his subordinate leaders decided to campaign against the Han on his own accord there was little the Chanyu could do stop him. There are obvious parallels between Xiongnu-Han relations and China's troubles with European imperialists in the 19th century. When the rhetorical garnish used in imperial proclamations to the outside world are peeled away the nature of both the unequal treaties and the heqin system can be seen for what they truly were: means through which foreign powers laid claim to China's wealth. Both were systems of extortion imposed by the threat of martial force. And in both cases the decision to cede to the foreigners' demands instead of mobilize the population for general war was a decision to relinquish sovereignty and claims of cultural superiority for the sake of political stability. Political stability was what the Han needed in the early days of their dynasty, during which time rebellions, uprisings, and attempted coups absorbed most of the court's attention. It was not until the reign of Han Wudi that the dynasts felt secure enough within China to turn their attention outside of it. There was also an important ideological shift that occurred during the reign of Han Wudi. Before Wudi’s time the dominant political philosophy at court was Huang-lao Daoism, which privileged emergent order over conscious creation and stressed that the best rulers governed with a light hand. The ascendance of classicist  political ideals was an important element in the Han's path to war. The classicists of Wudi's day had an unyielding commitment to hierarchy, ritual, and decorum. They believed that these principles should govern the conduct of all men. They were unforgiving towards all who disregarded them. To a mind steeped in the classicist ideology of the early Han, there was no breach of decorum more scandalous than a barbarian who called himself the Emperor's brother and extorted gifts from him as if he were the superior. The  heqin system was an affront to Confucian political philosophy. Jia Yi, perhaps the most brilliant classicist thinker of that age, expressed the outrage of it all by comparing "the situation of the empire [to a] person hanging upside down... To command the barbarians is a power vested in the Emperor at the top, and to present tribute to the Son of Heaven is a ritual to be performed by vassals at the bottom. Now the feet are at the top and the head at the bottom" . It is difficult to tell just how aware the Xiongnu were of the cultural crises their strategy created in China. In contrast to Buddhism, Christianity, Islam, and other belief systems of more Western origin, Confucian norms and philosophy never caught hold in Inner Asia. This explains why attempts to "corrupt" the Xiongnu and subordinate the Chanyu to the emperor failed so dismally. The nomads were eager to seize Chinese goods and luxury items, but were never economically dependent on them . Unlike in Japan, Korea, Vietnam, and the "barbarian" statelets of South China, the economic structure of the Xiongnu empire was radically different than agrarian China's. There simply was not enough common ground between the two peoples for Chinese lifestyles to be grafted onto the Xiongnu people. This is a recurring theme of Inner Asian history: nomadic elites could adopt the trappings of Chinese culture, but without moving off of the steppe they could never absorb its substance. The social worlds of the two peoples were simply too different. The ritualized and hierarchical relationships of the traditional Chinese family had no analogue in the egalitarian family life of the steppe. The first recorded Chanyu seized power by murdering his own father. The notion that 'filial piety' - or any of the other civilized virtues China hoped to 'tame' the barbarians with - could be instilled in the Xiongnu by giving them wives and clothes and toys was a political fantasy. It took the Chinese eight decades to come to the same realization. By that time influential voices in the court and men with experience on the frontier argued that the existing system could not meet its original aims. It could achieve relative peace and stability, but the Chinese no longer wanted that. They wanted superiority. That could not be had without switching to a much bloodier strategy. Part I of a series. Part II, which covers how the Han actually defeated the Xiongnu, is here. Edward Luttwak,"The Cycles--or Stages--of Chinese History," Strategika, Issue 11 (14 February 2014), pp. 5-11; The Rise of China vs. The Logic of Strategy (Cambridge, MA: Belknap Press, 2012), pp. 25-28. Thomas Barfield, The Perilous Frontier: Nomadic Empires and China, 221 BC-1757 AD (Cambridge, MA: Blackwell Publishers, 1989), p. 46; Nicola Di Cosmo, Ancient China and its Enemies: the Rise of Nomadic Power in East Asia (New York: Cambridge University Press, 2004), p. 193; Yu Ying-chih, “Han Foreign Relations,” Cambridge History of China, vol 1: Ch’in and Han, 221 BC-220 AD (Cambridge: Cambridge University Press, 1986), p 386. ibid., p. 47; see also the discussion in Sechin Jachid and Van Jay Simmons, Peace, War, and Trade Along the Great Wall: Nomadic-Chinese Interaction through Two Millenia (Indianapolis: Indiana University Press, 1989), pp. 30-51. The primary source I rely on for this section of the essay is Sima Qian’s Shiji or Historical Records. Luttwak's citation of this same source is needlessly obtuse; the relevant portions of the Shiji were translated and published in English by Burton Watson was over 30 years ago, and a newer, more scholarly translation of the relevant sections by a William Neihauser has been available for the last five years. The only purpose Luttwak's note that the text “is increasingly available in English translation" serves is to make it more difficult for those not versed in Sinological convention (i.e. all of the readers of Strategika) to investigate the sources Luttwak uses for themselves. For an account of the Battle of Pingcheng and its immediate aftermath, please see SJ 93 (Records of the Grand Historian: Han Dynasty, vol I, trans Burton Watson, p. 187); SJ 99 (Records, vol I, trans Burton Watson, p. 238); SJ 110 (Records, vol II, p. 138). SJ 99 (Records, vol I, p. 239). SJ 110 (Records, vol 2, p.145). Di Cosmo, Ancient China and its Enemies, p.224. Barfield, Perilous Frontier, 24-28. See also Philip Salzman Pastoralists: Equality, Hierarchy, and the State (Boudler, Co: Westview Press, 2009), 50-51. Yü Ying-shih "The Hsiung-nu," The Cambridge History of Early Inner Asia (Cambridge: Cambridge University Press, 1994), 125. That is, the ru (儒 ), in later ages to acknowledged as "Confucians." The label "Confucian" is probably anachronistic for this time period however, for Confucian ideology had not coalesced into a unified philosophical school. Quoted in Yu Ying-shih, Trade and Expansion in Han China (Berkley: University of California Press, 1969) p. 11. Nicloa Di Cosmo, "Ancient Inner Asian Nomads: Their Economic Basis and Its Significance in Chinese History," The Journal of Asian Studies, 53, no. 4 (Nov. 1994), 1092-1126.